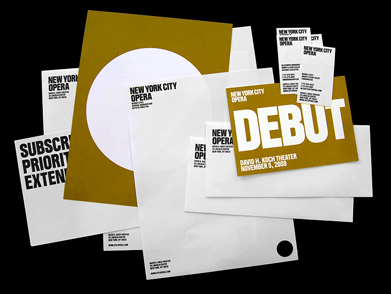 This is the daring corporate identity for The New York City Opera designed by 2x4 Inc. Some love it's simplicity, wittiness, and visual strength, others hate it. It is certainly daring, But does daring necessarily mean functional? 2x4 Inc. has become a very successful design firm and because of that it is also very respectable. It is difficult to question their decisions made when creating this logo. Personally I agree with the people that admire it for its wittiness and visual strength. It is innovative because no one has had the balls to do something as bold and simple before, probably the fear of being misinterpreted as something inferior to design through eyes that aren't educated enough. Although I doubt the success of the design with the color varying frames. I just see a plain circle on a plain background. I dont understand how this is "innovative"
It is innovative because it has never really been seen before. For instance take a look a white on white. I admire the "balls" that it took to do something so ridiculously simple, but at the same time, I definitely don't find it witty in any sense. I can't find any craftsmanship in a damn filled identifiable shape and I do not see how it represents opera, much less The NYC Opera specifically. This is kind of a shame as I love 2x4's work. Bold and minimalist, I like it. I agree that the color pieces are not as effective and seem incomplete. It's witty because it shouldn't work, yet for plenty it does. The association has been cemented in my brain, and i'm guessing that was the point. Well, I would like to learn more about the logo. Even though this is first article reading about it, but there is information in this article. There are opinions. But what the technical specifications of the branding? 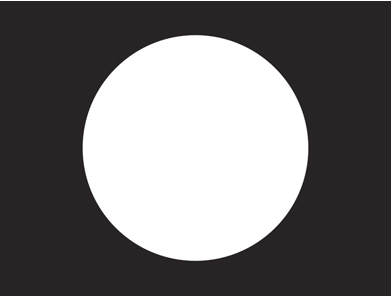 Is it always a white circle on a black rectangle? A look into the second photo, says no. Is that typeface part of the identity as well? Is tha brown-yellowish hue part of the branding as well? Or are those empirical marketing items that doesn't reference 2x4's new logo? Anyway, I have personal reasons why I like it. Mostly in reference to my senior thesis, but I would like to learn more about the constraints before posting my opinion. I encourage others to so as well. Our post provides a link to thier website if you click on the design firm's name. Their site was the main source for this post. The quote from the New York Magazine is the only text provided on their site when accessed January-18-2010. If you find any technical specifications of the branding feel free to share it with us! @Roxanne haha, thank you. I was looking into the Brand New website, but couldn't find anything. Would have made sense to actually check the studio's site. Thank you for giving me the heads up! Wow, yes! I agree with Adolfo. Opera House, I do not expect less for you. 2x4 CONGRATS, and I will certainly visit this blog with more frequency, it does share great things. Congrats to 2x4 if they see this, and congrats to the blog for your inspiring posts. I support these styles completely. Wing it. it's the light at the end of the tunnel !!!! it draws youtowards it. I think this is an awesome idea. Witty, relevant, and dialogue inducing. The strongest aspect is probably it's agility. The identity is malleable, a perfectly orchestrated identity that can be adapted to a variety of future situations and campaigns. While the stark circle may not be identifying on it's own, the canvas that has been designed is sustainable for years to come. Logos like this are def. cutting edge and I fully expect to see a trend develop. I was first introduced to 2x4 when they gave a visiting artist lecture at my university some years ago. Their work is always incredibly conceptual, innovative and inspiring. I love the logo and I wish more businesses would hire design firms that are as daring as 2x4. Sometimes simple is best. I think its very successful, after reading about the opera house and their personality as a company, this shows a charming and witty response. It obviously gained them some media coverage due to the design of the logo. I think its comes to life when used on other media. I think its hugely successful. innovative because "never really been seen"... innovation is deeper than that. when you talk about things like white on white, thats just a gimmick. gimmicks don't sustain.. Though I specialize in small business logo design and branding, it’s sometimes difficult to educate the client. I so appreciate when they come to me knowing what they are and are not capable of. It's just an empty eyesore. They're laughing at their client & the client is too pretentious to acknowledge that's exactly what they're doing. A well-designed logo allures a viewer to your product or service. It is composed of an inimitable design that distinguishes the product from the competitor's product. Its good for beginners to grasp quickly. I’ve been seeking on the internet just for a high quality read in regard to this unique subject matter . Exploring in Yahoo I finally observed this fabulous site. After reading this So i am thrilled to state that I get a fine impression I came across the very things I wanted. I will ensure to don’t forget this website and look constantly. Honestly, that's what I call simplicity at it's best!! Thanks for sharing. Great inspiration for my logo! I looked for one on twitter but could not discover one.I pray you would give some thought to doing the same. The identity is malleable, a perfectly orchestrated identity that can be adapted to a variety of future situations and campaigns. looked for one on twitter but could not discover one.I pray you would give some thought to doing the same. why is it controversial? I think it is kinda cool . . .
great job. . keep it up. .
very simple logo design and looking very unique. 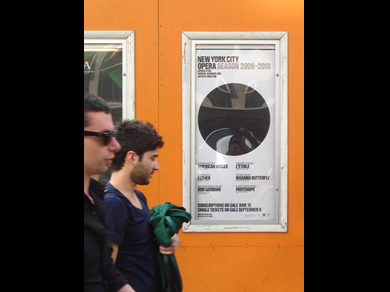 Well the Logo Design for New York City Opera doesn't look so bad. It looks fine to me! If you would ask me, I also like this design. It might be hollow but it conveys a lot of meaning. It's up to them to find out what they are. Great post. Gran blog. Todos los mensajes tienen algo que aprender. Su trabajo es muy bueno y le agradezco a usted ya salto para algunos puestos más informativo. Maybe it's bareness in the first image that most people don't like. I can't say I hate it but it does not really appeal to me. I love minimal design- clutter free convenience. But since this is for the New York Opera, I would think I'm expecting something more--- relative? Placing it with notices & as a background in the magazine works though. Thank you so much for sharing such a useful and creative post here with us.I appreciate your great effort keep it up and share more inspiring stuffs . i like the minimalism- if you can call it that. but on the other hand, it's an advantage if you have something more specific like name/words on the logo since not all people know about the New York City Opera. I would never have thought of re-creating spaghetti-0's, but I'll bet the grandkids will love them. Wow this is a great resource.. I'm enjoying it.. Wow. It's so nice sharing. i like this post because i get a lot with this post. Thank you for sharing this. i think it looks ok, as long as they keep the dark color in the background. it can be much mistaken for Japan's national flag though..
Hope in future we’ll get many this kind of informative information from this blog. Hi. Honestly, I don't quite understand why this has to be a controversy. It's just a logo. Hi there, I have a new logo in mind. It's much simple. It contains only letters with a minimal design. Why is this the proposed logo for New York? Well, it's their own decision. Keep posting please. Personally I agree with the people that admire it for its wittiness and visual strength. this is a great post.I have been wondering about this topic,so thanks for sharing. I will certainly be subscribing to your blog. Thanks for the logos! you did the attractive work it should be helpful to gain more commentators. Before making design you need to plan out what are the colors and other thing you want to add in design and one more thing is you also care about culture. this page is exactly what I was searching for! Anyway, I have individual factors why I like it. Mostly in referrals to my mature dissertation, but I would like to explore the restrictions before publishing my viewpoint. I motivate others to so as well. Really useful article. Bookmarked. Thanks for sharing. Dualistic in terms of color and form, yet holistic as one piece. Subject/object. audience/performance. It is what you project onto the work (or opera performance). In design do you need to plan what are the color and the other things you want to join the design and one more thing is that you also care about culture. Nice Thanks for sharing dear. This is very interesting, thanks for sharing this. In this era of technological advancement everything is quiet dependent on the way we present ideas. It is an indispensable aspect of marketing without which businesses cannot thrive. Your post was excellent, keep it doing. Thank you. how about that, i was wondering if it were true no I know!